Harpy Eagle is 2 inches high and 1 inches wide. The carving is astounding with a delicate downward carved beak and striped tail. He is perched on a branch. He also has three large striped upward facing plum feathers. 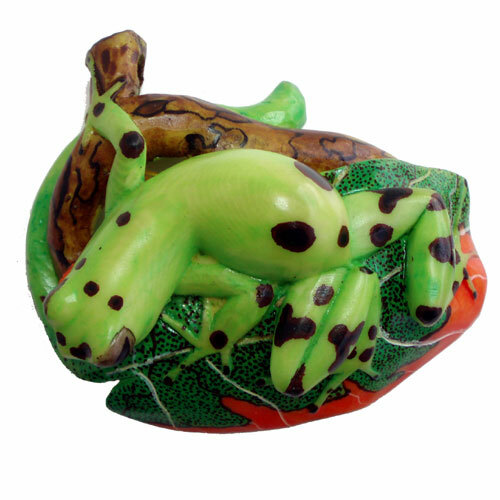 Large Green Frog on Leaf is 2 inches high and 2 inches wide. He is a light lime green color with dark spots on hind legs, head lower body and front legs. He is perched on an orange and green leaf with a spotted colored brown branch. There are many open areas for stringing. 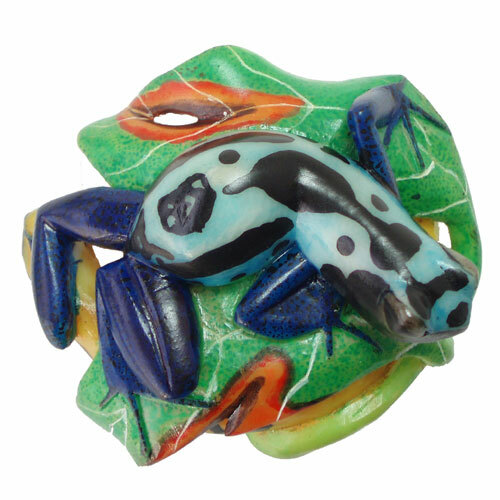 Large Blue Frog on Leaf is 2 inches high and 2 inches wide. He is a light blue color with dark spots on his body. The legs are very dark blue. He is perched on an orange and green leaf with a yellow branch. There are many open areas for stringing. Guacamaya is 2 inches high and 2 inches wide. What a beautiful bird this one is. 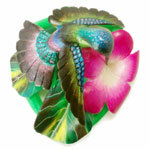 He has incredible bright colored plumage and a detailed beak and tongue. He is perched on a brown and green branch with several leaves attached. Large Humming Bird is 3 inches high and 2 wide. The details and colors are just incredible on the hummingbirds. 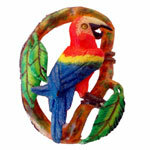 There are many openings for making the Flora and Fauna necklace (seen on the “Other Techniques” page of this site) or any other necklace you might dream up to show this bird off. Medium Humming Bird average 2 inches by 2 inches. The detail and color on these is equally as incredible as on the larger birds. They also have plenty of openings for weaving in or stringing. Small Humming Bird average 2 inches by 1 inches. The detail on these is equally as incredible as on the larger birds. They also have plenty of openings for weaving in or stringing. 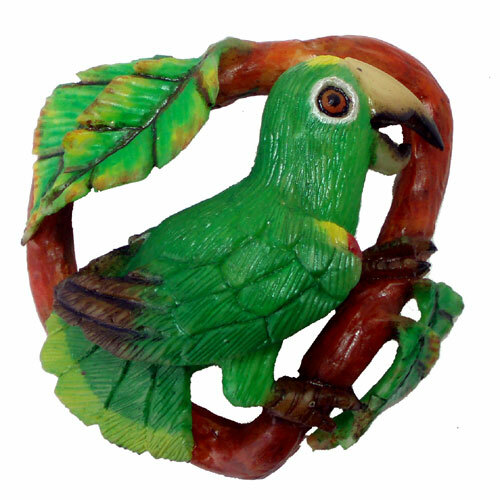 Green Parrot is 2 inches high and 2 inches wide. He has wonderful detail on the beak and feet. The feathers are extremely detailed. 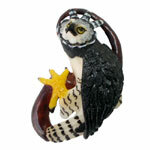 He clings to a round branch, which has many openings for beading. Imagine how he would look on the Flora and Fauna necklace. Small Jaguar is 2 inches by 1 inches. His head is tilted and his arms are outstretched and closed. It would be so easy to hang him on a beaded limb. He has great face and ear detail. His coloration is orange with brown spots getting lighter on the face, legs and paws. 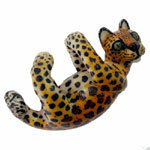 Very Small Jaguar is 1 inches by 1 inch. His head is tilted and his arms are outstretched and closed. It would be so easy to hang him on a beaded limb. He has great face and ear detail. His coloration is orange with brown spots getting lighter on the face, legs and paws. Small Tree Frog is 2 inches by 1 inches. 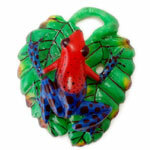 Perched on 2 detailed green leaves, this is a most colorful frog. The top half of the body is red with small black spots. The bottom half of his body is a beautiful shade of blue and has large black spots. The front legs match the lower body. The back of the leaf has two openings at the top for stringing. Spider On Leaf is 2 inches by 2 inches. I wouldn’t want to run into this guy in the forest. 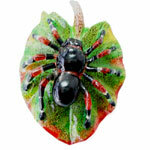 The spider body is almost 1 inch in length. The leaf has wonderful detail and is red edged. 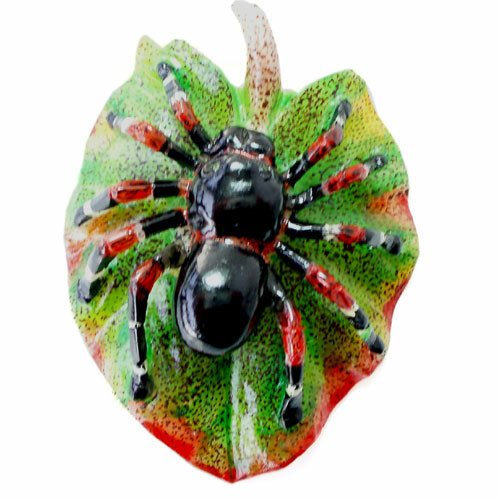 The spider also has some red on his legs. A loop has been made at the top of the leaf branch.